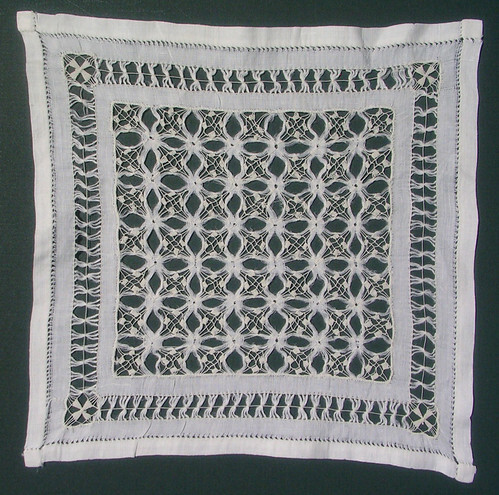 Here is a photo of a small square of drawn thread lace I found at my grandmother’s. She was born in 1899 and an only child. She and my grandfather only had one child, my dad. When she had my dad she decided she didn’t need to sew, but kept lots of family needlework from her mother, and maybe her grandmother. I didn’t get to ask her much about the needlework. The year I started in fashion design is the year she died, and at the time I was more interested in designer fashion than old needlework samples. Now I realize how all needle crafts are related, each adding to the others. This sample is one of my favorites. The threads are so fine that they make cottony drapes across this small piece of lace. I feel fortunate to have these samples of needle work to look at anytime I want. I am sure some belong in a museum. In the meantime I am glad I am able to take care of these few bits of fabric that meant so much to the person who made them. I only hope my work will be taken care of as well. This entry was posted on Monday, November 24th, 2008 at 3:00 am and is filed under Embroidery and Lace. Tagged: Drawn-thread, Needlelace. You can feed this entry. You can leave a response, or trackback from your own site.